Mr. Hagopian is a co-founder of the company and serves on the Board of Directors. He has led Medica’s business growth from the company’s startup to the current operation levels, guiding Medica’s proprietary knowledge, product development capabilities, and manufacturing technology, to meet global market needs. Mr. Hagopian holds a Bachelor of Science Degree from the Massachusetts Institute of Technology and a Juris Doctorate from Western New England College. Previous to Medica, he was a Director and Vice President at Orion Research Incorporated. Mr. Rettew is a co-founder of the company, Treasurer, and serves on the Board of Directors. Steve also served as Vice President of Product Design from 1983 to 2018. During his time as Vice President, he focused on developing medical devices that integrate the science and technology requirements with good design, such that the finished product enables ease of use and service by customers in the global market. Mr. Rettew holds a Bachelor of Science Degree in Industrial Design from the University of the Arts in Philadelphia. Previous to Medica, he was Manager of Industrial Design, Orion Research Incorporated. Ms. Gallagher joined Medica Corporation as Vice President of Finance in September 2008. She is responsible for banking relationships and all financial activities including audits and financial reporting. Her career has included accounting and finance activities in the semiconductor, medical, and consumer electronics industries. Previous to Medica, Ms. Gallagher was Vice President of Finance at Harman Specialty Group, a division of Harman International. She received her Bachelor of Science degree in Accounting from Fairfield University and her MBA from Babson College. Mr. Whelan joined Medica in 1984 and is responsible for managing the development of software and electronics for the company’s products, considering each product’s need for ease of use, extensibility, and exacting performance. Prior to joining Medica, he was employed by C.R. Bard, developing infusion pump delivery systems for insulin and pain medication. Mr. Hinz joined Medica as the Vice President of Operations in May 2018. In this role, Bob is responsible for strategic sourcing, planning, purchasing, manufacturing, logistics as well as leading the manufacturing engineering team. Mr. Hinz has a strong technical and operations background in a number of industries including semiconductor, contract manufacturing and process fluids filtration. Prior to entering the civilian workforce, Bob proudly served in the U. S. Navy Submarine Service as senior nuclear operator with his last tour as the Chief of the Boat of a fast attack submarine. After leaving the military, he held both operational and organizational leadership roles with FEI Company, Millipore, Carl Zeiss, and Koch Membrane Systems. Along with a Lean Six Sigma Black Belt certification, he is a graduate of the Navy Nuclear Power School, has a Bachelor of Science in Business from Excelsior College and an MBA in Technology Management from the University of Phoenix. Dr. Barry joined Medica in 2013 and was appointed to his current position in 2017. Prior to serving as VP Research and Development, he held the position of Director of Research and Innovation, responsible for new product development and advanced technologies. 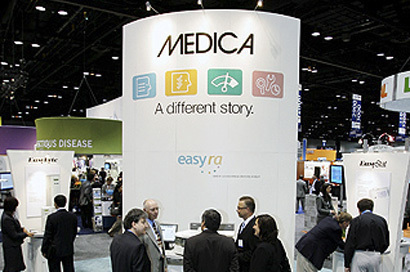 Before joining Medica, he held various leadership roles at PointCare Technologies, responsible for leading the development of novel flow cytometry and hematology systems. Dr. Barry holds bachelor’s degrees in physics and mathematical science from Colby College, a master’s degree in physics, and a Ph. D. in biological physics from Worcester Polytechnic Institute. Ms. Williams joined Medica in 1985 and now serves as Vice President of Human Resources. She has over 20 years of experience in employee benefits and human resource management and administration, and holds a SPHR (Senior Professional in Human Resources) certification. Ms. Williams has previously served in administration roles at BayBank, Harvard Trust, and Mount Auburn Hospital in Cambridge, Massachusetts.